The Connemara Bog Oak is a limited edition that was drawn from just three casks that yielded around 1000 bottles. 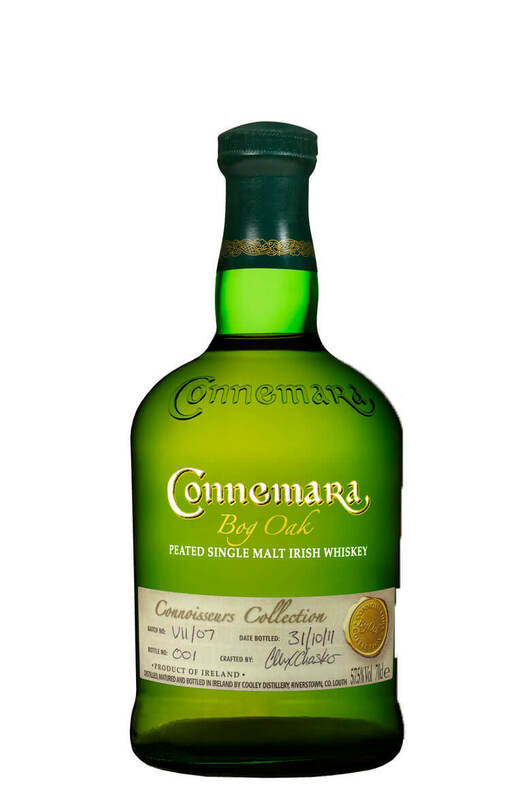 The malt used in each cask was slightly different with some highly peated young whiskey going into two and the the third having some more mature standard peated Connemara. The casks used were highly unusual and were a world first. Each barrel was altered and refitted with ends made out of Irish bog oak. Bog oak is ancient wood that has been preserved by peat bogs over centuries and occasionally millennia, it is quite rare and usually expensive therefore it would be prohibitive to make an entire cask out of it. However the bog oak ends had a definite effect on the the whiskey with many people picking up a pronounced marmalade/citrus peel character. What we can say is that it worked pretty well! Nose On the nose there are pungent smoke aromas, some hints of tarred rope, sea air, caramel and bananas. Palate Mouthfilling and chewy with a big delivery of smoke and a volcanic explosion of alcohol. Once it mellows soft flavours of banana, mixed citrus peel and chocolate appear. The smoke persists all the way to the finish which is warming and very long lasting. Colour Pale gold in colour with great viscosity. Age range Malts aged between 4 and 15 years old. Style Highly peated, double distilled single malt.